Final race of the CYC Edmonds Halloween Series. A solid performance with a solid crew. Light wind at the start, but it eventually filled in nicely. Also a bit of fog that burned off in time to clear the race course. Had a fun race with "the old gang" who all sailed the Duck Dodge Pirate Night earlier in the summer, Mathew, Bill, Ryan, Scott, and Captain Carl. Had a solid start, getting a good run at the favored end of the line, though had to miss the Committee Boat with less grace than was comfortable. This was the course North of the marina, so less familiar to us than the course to the South. Though also without much fear of running aground in the thin waters that are to the South. Beat North as the other racers stretched out the lead in the light airs, which Esther does not excel in. We got to the first mark after a few tacks, rounded while avoiding a closely anchored fishing boat, then bore downwind and popped the chute. Naturally sailboat racing was too easy in the past, so they invented the spinnaker to make it dangerous again. We did fairly well getting it up, but the skipper's poor tactical choice to tack trying to get on a line for the downwind mark bodged things up a little. The wind did get better as the race progressed, and after we doused the chute into the main salon, we put in a course back upwind and darn near a perfect close haul on a single tack to the upwind mark again. Mathew had to hustle a little repacking the chute as we got back back so quick. 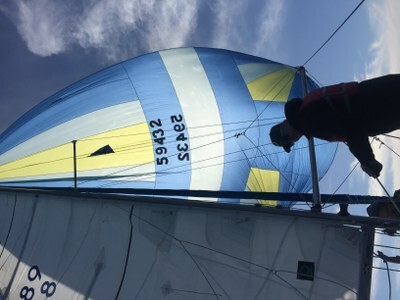 A second rounding and spinnaker set that was cleaner than the first, and a nice reaching course to the finish found us in a solid third place (out of three, I must admit). But at least the Committee Boat didn't pack it in before we finished, giving us a corrected time only 7 minutes behind the second place boat and 10 behind the first. We retired to the local bar and grill, the Channel Marker, for celebratory beers and nachos. I, for one, can almost hardly wait to race again in the late winter. I'd like to thank everyone who came and crewed on races with me this year. It was fun and a real learning experience.